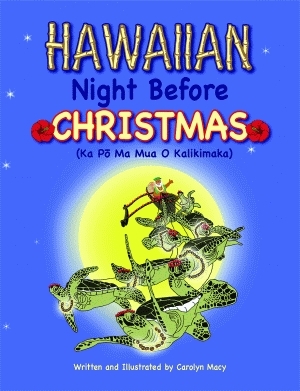 Adapted from the classical children’s poem The Night Before Christmas, this version celebrates the beautiful islands of Hawaii and the traditions of the locals. In this lush tropical paradise, they refer to the holiday as Ka Po Ma Mua O Kalikimaka. The house, or hale as they call it, is made ready for Santa’s arrival. Mama, Papa, and the keiki (children) have decorated a coconut tree, placed the lauhala (woven baskets) on the porch, and left a snack just for him to enjoy. As the children drift off to sleep, visions of what Santa might bring fill their dreams. While Mama and Papa watch as Santa, known as Kanakaloka, comes drifting in with his net full of toys. He surfs to the island on his outrigger canoe led by his majestic sea turtles. As he arrives at their hale, he listens as the holiday ornaments magically come to life. The decorations dance all around Santa. It is through their whispers that he knows just what to leave each girl and boy. When Santa is ready to depart, Mama and Papa present him with a lei and bid him farewell as he rides the waves out of sight. Carolyn Macy is a retired schoolteacher. To ensure that both of her children would learn to have a better understanding of people and places outside of their native Oklahoma, she and her husband traveled each year to a new locale. Their goal was to have visited all fifty states by the time the children were adults. The last state they visited was Hawaii, and this visit left a lasting impression on them. Macy and her husband now spend half the year in Oklahoma where their son resides and the other half of the year in their newly adopted home of Hawaii where their daughter now lives. Macy received a bachelor of science degree in commercial art and biology, minoring in chemistry, she also received a master’s degree in natural science. Click here for sample pages. Click here for Chapter 1. Click here for the Front Matter.